The World's only 90~95%% match to the McCree Curve LED Grow-light. The PRO-LEDTM Grow-lights are fixed spectrum lights, with a 90~95% match to the McCree Curve, and about an 80% match to Sunlight, passive cooling, with your choice of 60°, 90°, or 120° glass lenses. The PRO-LED-100W lights are ideal for seedlings/cloning areas, small grows, or as supplemental lighting. Give your plants the light they need to grow and thrive with the PRO-LED Series. The PRO-LEDTM McCree Series LED Grow Lights, are a professional grow-lighting fixture with premium MeanWell HBG-100 series UL and CE approved drivers, over-spec passive heat-sinks, and high quality borosilicate glass lenses. 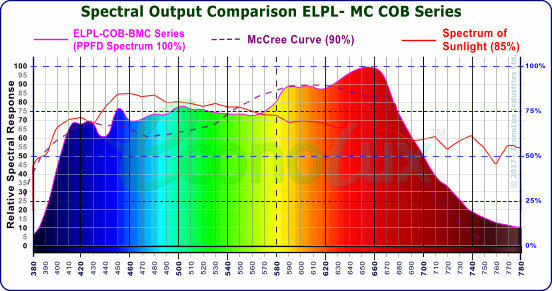 The spectrum of the lights are based on the latest scientific research and utilises the ELPL-MC COBs, which have a 90+% match to the McCree Curve, and an 80+% match to sunlight. 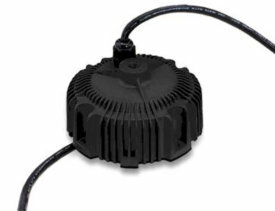 The PRO-LEDTM LED Lights are designed for the rigors of high-humidity Greenhouse environments. They are water resistant (IP-54) and have no fan as they are a passively cooled light (convection cooling), and they are made from durable, rust resistant, powder coated. aircraft grade aluminum for a long lifespan. They can be used in groups (with 7 PRO-LED lights [700W] replacing one 1,000W HID light) for commercial scale growing saving over 35% in energy costs. The McCree curve is the spectral curve that scientists have determined is the best for growing a variety of crop plants (see What Light Do Plants Need?). Our PRO-LEDTM light has a 90~95% match with the McCree curve - see chart on right. The extra UV and blue light (compared to most grow-lights) provided in this spectrum is ideal for applications such as growing leafy green plants (lettuce, kale, arugula, etc.,), herbs (parsley, rosemary, basil, etc.,) and for germination and cloning of Cannabis plants. UV light is also a major contributor to the production of resins in Cannabis plants. The plethora of red light in the spectrum insures that these lights are also ideal for growing all types of flowering and fruiting plants. As you can see from the spectrum graph above, the light output of the PRO-LED Series has a 90~95% match to the McCree curve, and a more than 80% match to the spectrum of sunlight - exactly the spectrum your plants need. The graphs (below), from our plant/grow light spectrometer, measuring in PPFD (PAR)*, shows a comparisons of the PRO-LED Mc 100WTM spectrum, to various standard curves for Chlorophyll A, Chlorophyll B, and Beta Carotene - the light absorbing compounds in plants responsible for growth. The PRO-LEDTM Grow Lights match to these curves is very close due to the ELPL-MC COBs careful construction, and the use of our self-developed and proprietary Mc85 phosphor coating. The PRO-LEDTM	McCree LED grow-lights are built with the most advanced, proprietary, LED technology to insure maximum output, a close match to the McCree curve spectrum, long service life, and maximum energy savings. The drivers are premium quality, MeanWell brand HBG-100 series, with a metal case, and with universal (100~250VAC, 50/60Hz) power input, thus they can work almost anywhere. (Higher input voltage models, and models with DALI are optionally available.) The drivers are also IP65 rated, CE and UL approved, and come with a 5 year warranty. The housings of the PRO-LEDTM	LED lights are carefully designed, with internal heat-pipes and large heat-sink fins for effective passive cooling of a 125W COB. There is 25% more cooling capacity than needed - this means no noisy, high maintenance fans. With an IP-54 water and dust proof rating, they are well suited to the high humidity conditions found in greenhouses. The PRO-LEDTM	LED lights can save 25% to 30%, and often more, in energy costs compared to conventional metal halide or high-pressure sodium grow lights. They also save time and money on maintenance as the annual bulb changes required by typical conventional lights is not needed anymore. These savings are available while providing a perfect spectrum with a close match to the McCree curve and the spectrum of Sunlight, with an increased crop yield due to the additional wavelengths of light that are not available from the typical LED grow-lights. 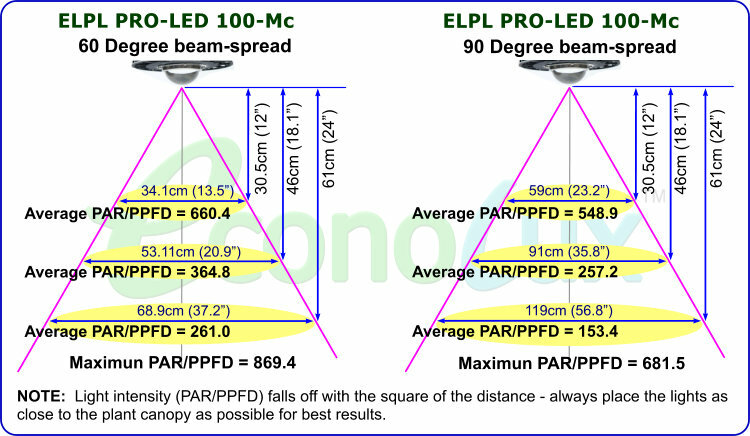 The charts below show the coverage area of the PRO-LEDTM	LED lights, along with the average PAR/PPFD at various distances from the lights, with the most popular 60° and 90° lenses installed. 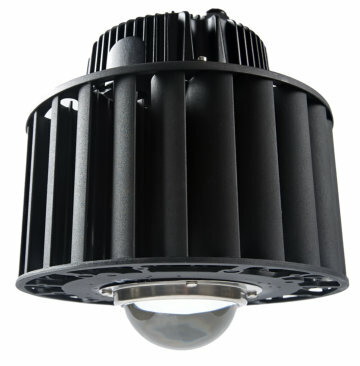 We recommend the 90° lens for most applications where the lights will be hung about 30.5 cm (12') above the plants. We recommend the 60° lenses for greater hanging heights (46cm - 18"). Other beam-spread lenses (45° and 120°) lenses are optionally available. *PPFD: Lighting for plants is different from lighting for humans. Light energy for humans is measured in lumens, with light falling onto a surface measured as illuminance with units of lux (lumens per square meter) or foot-candles (lumens per square foot). Light energy for plants on the other hand, is measured as photosynthetic Active Radiation (PAR), with light falling onto a surface measured as photosynthetic photon flux density (PPFD). 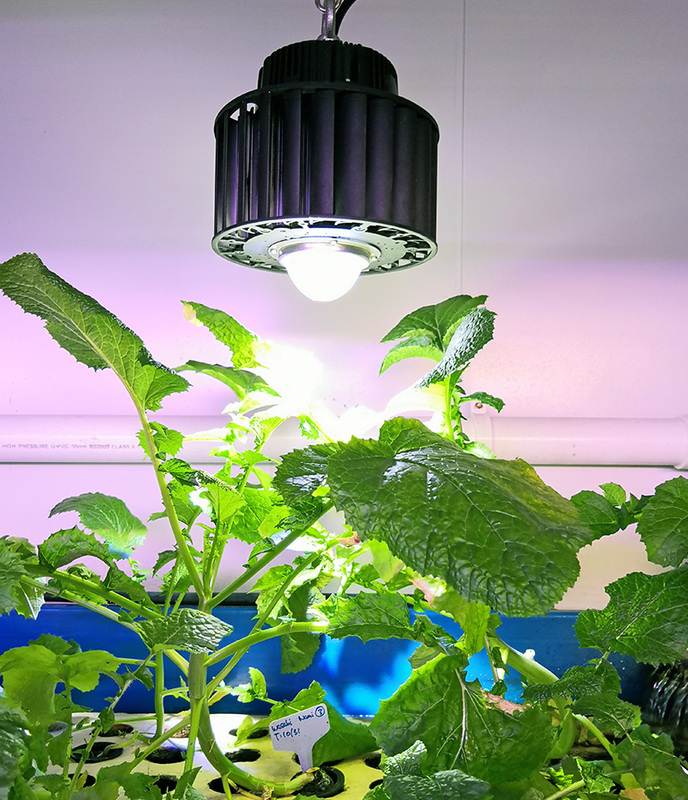 Lumens are for humans - PPFD/PAR are for plants!